We currently have a small flock of 5 Rhode Island Red hens and 1 Plymouth Rock rooster. My husband and I raised the hens from day old chicks. When one of our immature hens went missing, we picked up our young rooster for free from a local farm. He’s kept the ladies safe ever since. Since no one felt like going broody last spring, I’ve decided to buy some more chicks this spring. In Maine, you must buy a minimum of 6 poultry (6 chickens, 6 ducks, 6 turkeys…), so I guess we’ll get 6 more chicks. If all goes well, we’ll have 11 hens and 1 rooster. Sounds good to me! Our chickens won’t go out on the snow. I’ve tried opening their coop in the winter before. They take one look at the snow, clearly say “Nope!” and quickly hop away. Because of our painfully long winters, the chickens stay in their coop from November to the end of April; half the year! To keep their spirits up, I feed them sprouted wheat and sunflower seeds. They literally jump for them when I enter the coop. It only takes a few minutes a day and seems to keep them happy and healthy. I drilled lots of small holes in large tupperware containers from the dollar store. I keep them in our shower. 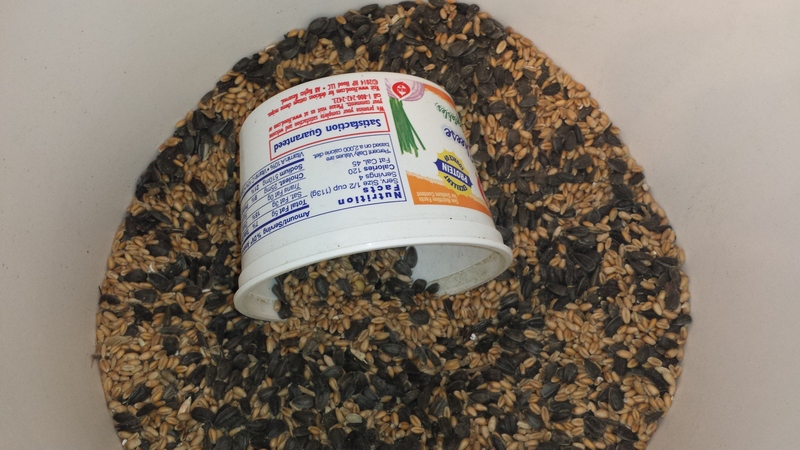 Every morning I fill a large yogurt cup with wheat and sunflower seeds. 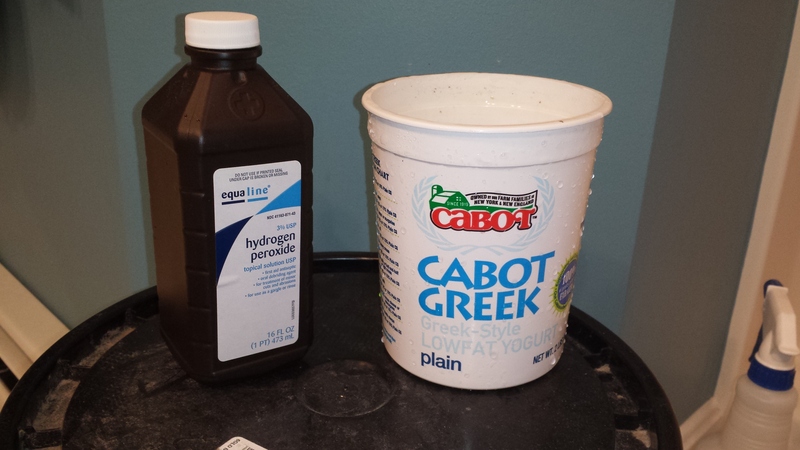 I give it a little squirt of hydrogen peroxide (to inhibit mold) and fill it to the top with cool water. I rinse the stacked trays for a few seconds and bring the top tray out to the chickens. 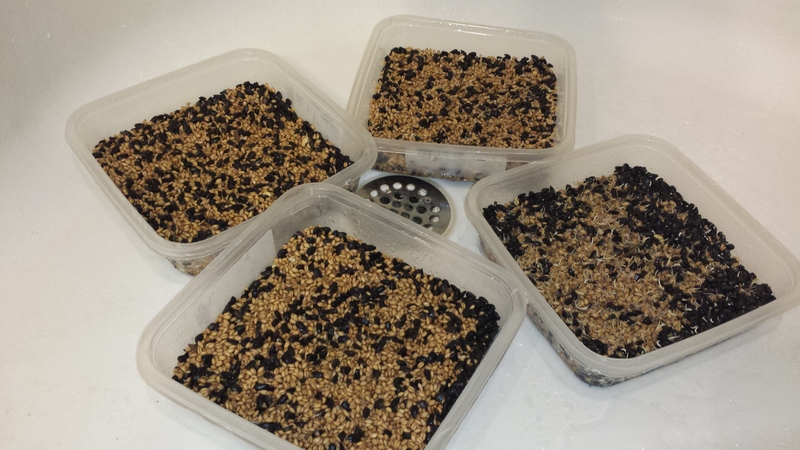 In the evening after work, I lay the trays on the floor of the shower and pour the soaked seeds into an empty tray. I rinse them all well and stack them back up for the morning. I buy a 50 lb. bag of wheat and 40 lb. bag of Black Oil Sunflower Seeds for $34 at our local feeds store. 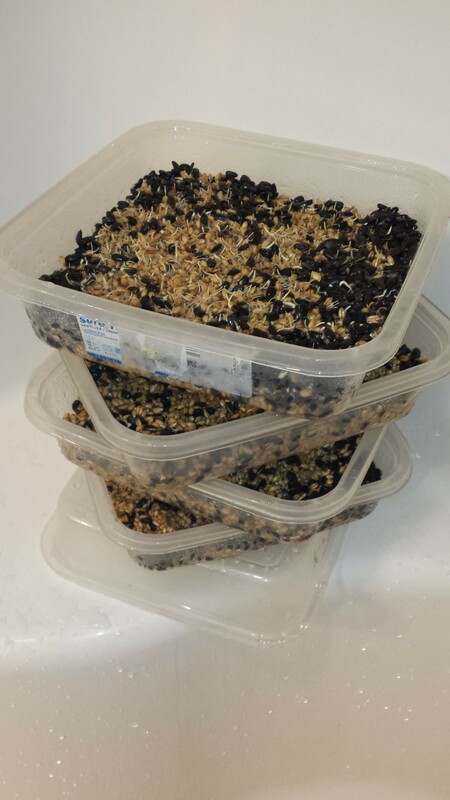 Due to the soaking and sprouting, it doubles in weight and nutrition so I end up getting 180 lbs. of high quality feed for only $34! The chickens get one tray a day. Since I have 4 trays in rotation, the seeds are 4-5 days old and bursting with nutrients that the seeds plan to use to make leaves and begin plant life. Only all that energy goes to the chickens instead! They feed on the sprouted seeds until they can forage full time in the garden; around May.